Go beyond with the Hanns•G SL231DPB monitor. Featuring a 23" 16:9 wide screen with 1920x1080 Full HD resolution, this monitor is great for movie enthusiasts since most films are presented in a similar aspect ratio. 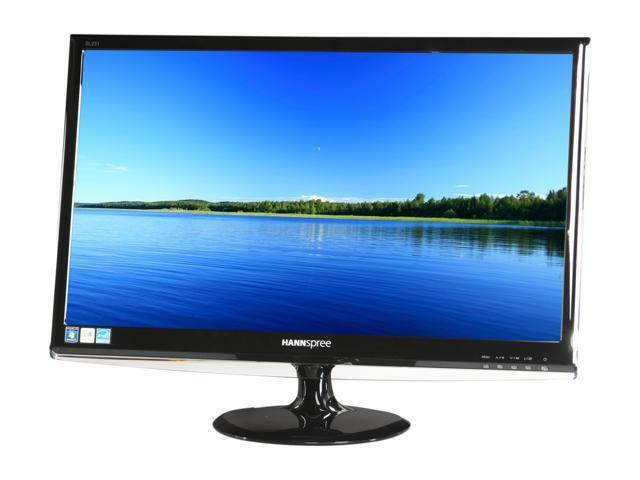 With this Hanns•G monitor, there's no need to sacrifice visual real estate for black bars! The built-in speakers produce rich, full sound for added entertainment while saving your desktop space. Whatever you view will look fantastic, thanks to the 1000:1 typical contrast ratio and 5ms fast response time. When you upgrade to a Hanns•G monitor you'll love what you see! FULL HD Support With a maximum resolution of 1920x1080 and widescreen (16:9) aspect ratio, the Hanns•G SL231DPB monitor displays Full HD 1080p content in its native format without any loss of image quality. Built-in Speakers The Hanns•G SL231DPB comes with built-in stereo speakers for rich, vibrant sound while saving precious desktop space. Pros: I had a pair that lasted 7 years and functions flawlessly. Other Thoughts: I would purchase again if they were in stock. Would definitely recommend to others. Pros: I use this monitor for gaming and its great. I have a second one hooked up to my Xbox360 in my room and its perfect. No problems ever. Cons: The speakers like all built in monitor speakers are not good. This set is really bad. Pros: The picture is quality is great as is the contrast. WAY brighter than any of my other monitors. 23" is all anybody is ever gonna need, its plenty big for a computer monitor. Very Cheap. sadly its out of stock i was going to buy a second one. Cons: No HDMI? It has dvi and vga but no hdmi. :( minor problem though seeing as there are converters and most GPUs have at least one dvi. Cons: Sound output on internal speakers is weak, but you don't buy a monitor for speakers. -Comes with speakers, which is nice if you don't have any (although they are bad speakers, but they come with it. Something is better than nothing after all) but if you don't have any you'll want to buy some eventually. Other Thoughts: While there's not really any cons for this, there's certainly a few minor thigns here and there which you can tell are average quality, the buttons, the stand etc. None of them are bad, but if you do splurge some and buy a more expensive monitor such as a Samsung you'll definitely see a difference in the quality of these small things. But it's a good monitor for what it costs. Pros: Good Picture, easy setup, light weight. Cons: No VESA mounts, connectors stick straight out the rear making it difficult to place flat against a wall. Unit was missing the screw that connects the base on the stand. And with no VESA mount, this is a major inconvience but and not worth the hassles of contacting support. Other Thoughts: This was purchased as a backup and stayed in the box for over a month so the missing screw wasn't noticed until factory support was the only option. Major bummer. Other Thoughts: So I purchased this monitor for my son and man was it nice. I had been using a square 17" that I had for NINE years, but sadly it finally died. After five months or so the power to the monitor would randomly shut off. I would unplug the cord from the power strip and plug it back it and it would be fine. It steadily became worse, happening daily and it would take me unplugging it 7-8 times before it would work. I contacted Hannspree and they told me to go out and replace the power cord portion myself as it shouldnt be the power transformer. As cheap as that is I did it, and it worked....for the last three months. The problem is back again and when I called them back for service they said the power supply is only under a 90 day warranty. I do not have my warranty card any longer as its listed having a 3 YEAR LIMITED warranty...I guess the power supply is covered under the LIMITED portion. I do not recommend this product and will avoid them in the future.